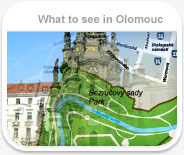 Olomouc, the oldest and the largest historical town protected monument reserve in the Czech Republic after Prague, is full of precious monuments and landmarks. The Upper Square (Horni Namesti) surrounded by magnificent palaces is dominated by the Holy Trinity Column (on the UNESCO World Cultural Heritage List) and by the Renaissance Town Hall with its Astronomical Clock and tower. The historical centre is adorned with valuable ecclesiastical buildings, a number of Baroque fountains and twisting lanes. The centre is enveloped by the remains of fortifications built by the Empress Maria Theresa, and exquisite parks.